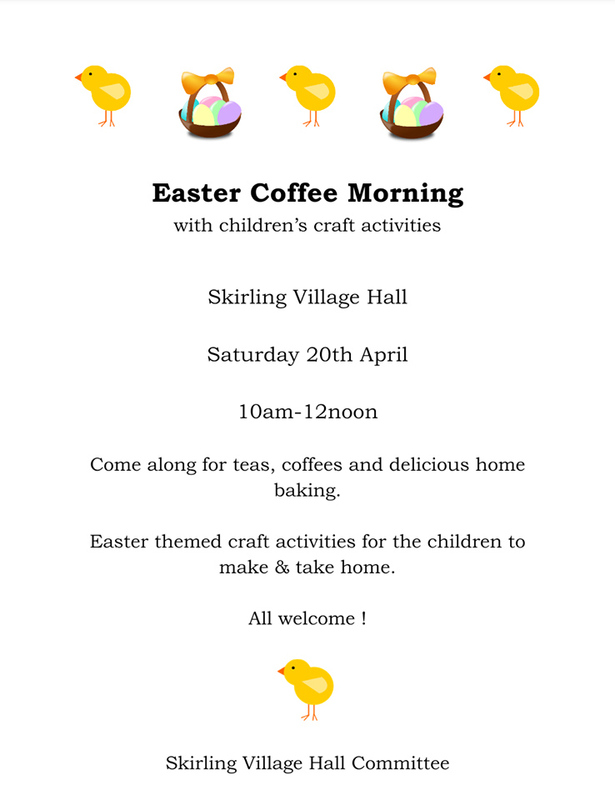 On Saturday 20th April, come to the village hall for a coffee morning for teas, coffees and delicious home baking. There will be Easter themed craft activities for the children to make and take home. Click here for the poster. Badminton and table tennis evenings for high school aged kids and adults returns on Sunday the 28th April. This will continue to run fortnightly. £1 for children and £2 for adults, most kit provided, but please bring your badminton racket if you have one! Join your neighbours for the First Thursday Lunch Club on Thursday 2nd May from 12.00pm. Delicious soup, sandwich and traybake with coffee or tea all for just £2 per person (50p for under 12s). The annual car boot sale returns on Sunday 12th May from 2pm to 4pm on the village green. Come along and raise some money for yourself as well as Christian Aid for just £7 a car. Or snag yourself a bargain, a plant for your garden and enjoy tea in the village hall. Skirling Community Council has been provided with a second year of funding for the Borders Youth Bursary Scheme. The money is to allow children in Skirling, 18 and under, to participate in sporting and artistic activities that they would otherwise not have access to, due to our rural location and/or lack of funding. If you have an idea for our community and would like the support of a local group, please do not hesitate to get in touch via the Community Council or the Skirling Village Hall Committee.